1. Be honest, be honest, be honest. Start with your profile and go on being honest from there. It may be tempting to stretch the truth a little, but remember your goal, which is to meet someone special. If you are not honest from the outset you WILL run into problems later. Don’t learn this online dating tip the hard way. 3. Choose a good photo (or photos if you’re allowed several) for your online dating profile. This is one of the most valuable of online dating tips for women because men go by the photos initially when looking for someone to contact. What do I mean by a good photo? Not one that makes you look stupid or easy or strange… Think about what kind of image you want to portray. The girl next door perhaps. Get a friend to take some photos of you or go to a professional photographer and explain what you need. It should be well worth the investment as the photo you use is so important. 4. Decide what you want from a relationship before you start. What are you looking for, love, friendship, a good time? If you are not completely clear on this you may send out conflicting messages or end up wasting your own time and other people’s. 5. Once you meet someone online a very good dating tip for women (and indeed, for men) is not to try to tell him your life story in a single email or message. Keep emails to a reasonable length, leave him wanting to find out more about you, not thinking that you are long-winded and boring! Also, be a good listener – ask him about the things he talks about in his email. Get interested in his life too. 6. Once you have a boyfriend, be appreciative of the things he does for you, however small, and express your appreciation. Being appreciative is an important part of building and cementing a new relationship. Further Reading/ more online dating tips for women: How to Contact Men or Women Online For Dating. Don’t be intimidated by the online dating world; best places to meet single women: more advice and tips from SingleDating.com. The ‘home page’ or hub for our dating advice and tips articles at SingleDating.com. 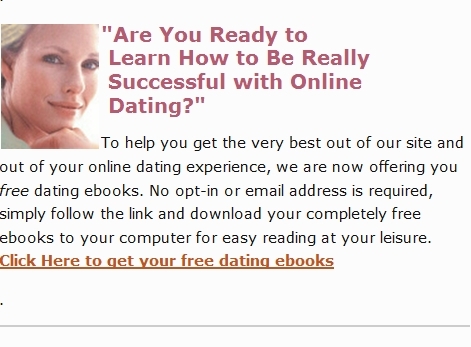 Online dating ebooks full of dating tips for women and girls (as well as for men, of course). Some of these ebooks are free – just download them to your computer. The first date, where to go and what to do. Browse the dating profiles at PenPalsPlant.com now and find single men who would like to meet you. It’s free, it’s easy to use, give it a try right away. Please check your browser’s address bar: if you’re not seeing this “Dating Tips For Women and Girls” post at http://www.singledating.com/blog/ then you are most likely reading an unauthorized copy as this content is exclusive to SingleDating.com and is copyright. Please navigate directly to www.SingleDating.com/blog now for the real page. Don’t forget to bookmark this post about online dating tips for women.